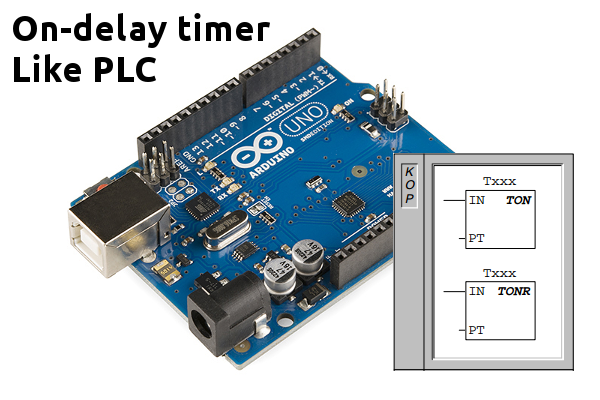 Using a On-delay timer in a PLC is straight forward, and with this clever function is easy on an Arduino too. 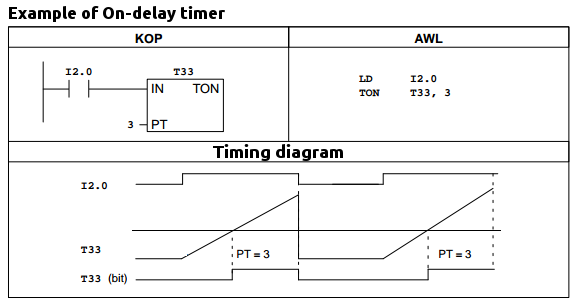 On the arduino the same can be achieved defining a data type structure called “timer” that contains two bits (in, q), the preset (pt) and the counting value (et) which keeps track of time. Once we have the “timer” data type created, we must create the timers, which we call “t[i]”, where i is the number of the timer. 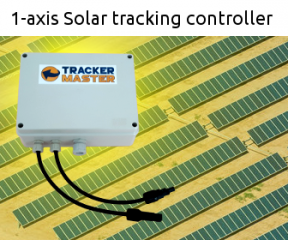 MAXT is the total number of timers we use in the program (or more). 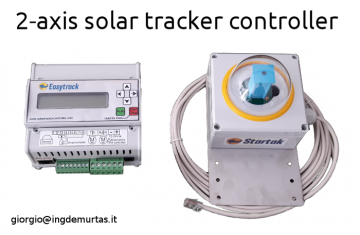 To access the input enable of timer 3 for example, we write t.in. The output of the timer is t.q. Don’t forget to tell the timer how much time is the preset, in hundreds of seconds t.pt=500 (5 seconds). The preset timing (pt) must be specified in hundreds of seconds, either in the “setup” or in the “loop”. The only difference with the PLC, is that on the arduino it is more practical to “count down” rather than “up”. The On-delay has elapsed when “et” is equal to zero. This program will turn on a led (pin D13 on arduino nano) after 1 s from the button press. Two second after, a second led (pin D2) will go on. boolean q; //Q: the timer output, that would be ON after ET=PT. t.pt=100; //preset time. Can be in setup or in loop. t.pt=200; //preset time. Can be in setup or in loop. t[i].et = t[i].pt; //preload the "elapsed time" with "preset time". Nota that the count is towards zero. if (t[i].in && t[i].et>0) t[i].et--; //decrement the counting value ElapsedTime if the in is acrive and if et>0. The smart thing of this program (inspired by this and this), is that we can create new timers simply calling them t[whatever], and set the delay time with t[whatever].pt , and access the bits with .in and .q. The smart thing is that we have one single function that manage all the timers we have in our program with a “for” loop, taking cares of increments and bits.